This conference carries forward the debate around strategic policy for multimedia and open learning. It is positioned at the MOOC crossroads where the interests of business and academia converge. 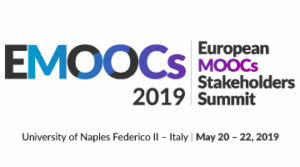 EMOOCs 2019 is heading to Naples, Italy, May 20 - 22 2019, organised by the Federica Weblearning Centre at the University of Naples Federico II. You are warmly invited to Naples to join the debate. EMOOCs has brought together 1,200 attendees and more than 500 organisations from 50 countries. A truly international audience of leading researchers, practitioners, policy-makers and corporate players. Contributions are invited in five areas: Experience and Research, both with Springer Proceedings, Policy at institutional, national and European level; Business addressing the lifelong learning sector, both with online proceedings; interactive Workshops. The Call for Papers is now open, and full papers should be submitted online. Check out the stunning conference venue with its city-centre, sea-front location. Register now for EMOOCs 2019!